The Jason Giambi Reunion Tour has officially been canceled. The last-place A’s gave the aging slugger his walking papers after he was able to scratch together a rather woeful .197/.332/.364 line. His release probably means that it is curtains for a successful, albeit tainted career. This season has been chock full of disappointment for the A’s, who looked like contenders headed into the season. It appeared they might have won the Defensively Challenged Slugger Sweepstakes after they signed Giambi to a low risk, one-year, $5.25 million deal, which included a $4 million option with a $1.25 buyout. The contract essentially valued Giambi as a 1.2 win player — bargain basement stuff considering Giambi was worth nearly 6 WAR over his previous two healthy years, which included a 32 HR season with the Yankees just last year. Now that it’s all but over for Giambi, where does he rank among the all-time greats? I’m not sure anyone will confuse Giambi as a future Hall of Famer considering his checkered past and also the era he played in, but for his career he was one heck of a ballplayer, even if he was quite overpaid from that colossal contract the Yankees gave him. His 52.3 wins above replacement ranks 150th overall according to Rally’s historical WAR database. That total is better than 48 players currently in the Hall right now, for what it’s worth. We hoped you liked reading It’s Curtains for the Giambino by Erik Manning! Comparing Jim Rice to Jason Giambi is just stupid. Cause neither belong in the hall of fame you mean? Cause Giambi was a much, much better player? And that is stupid because? One was a DH and/or below average defensive 1st baseman who was a known steroid user playing during a period of inflated offensive numbers. The other was an average outfielder who played during a strong offensive period, but nothing like the past 15 years. We don’t have the data to accurately rate his defense, but a lot of accounts are that he eventually became above average at playing LF in Fenway. Neither belong in the Hall of Fame, though. But honestly why does anyone care about that place? Really who are the accounts from? Dan Shaughnessy & Peter Gammons? 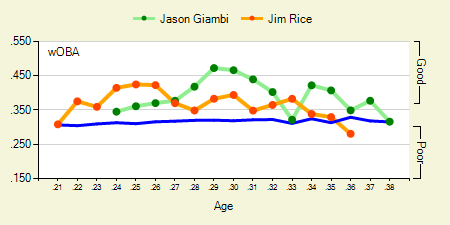 Both Rice and Giambi’s value was derived solely from what they did in the batters box. According to this (http://jim-rice.blogspot.com/), Bill James’ work on defensive win shares found that Rice’s defense was worth 35.6 Win Shares over his career, and he recieved a C+ rating from him. Right, so James concluded that Rice was an ‘ok outfielder’. If you are an average fielder at a position at the wrong end of the defensive spectrum then doesn’t that suggest that all of your value was at the plate? Well, assuming Rice was an ok fielder, it suggests that his defensive play added more value to his overall production than Giambi’s poor defense at 1st (or no defense at DH), which are both even farther on the “wrong end of the defensive spectrum” than LF. The positional adjustment used on this sit for a LF is -7.5 and -12.5 for a first baseman. The five run difference is already half a win each year, so if Giambi is below average defensively at 1st and Rice was average or slightly above average in LF there is a 1-1.5 WAR difference between them already. 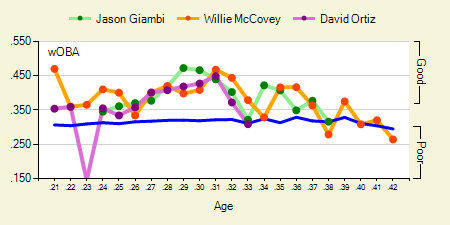 Does Giambi’s offense make up for the difference–maybe, but to straight up compare them solely on wOBA is stupid. And again Giambi is a known steroid user. Sure so was another large portion of the league, but it has to be considered that they were playing in completely different eras with completely different training regiments. It’s stupid because Giambi played in an expansion era, in the steroid era, and he, himself, took lots and lots and lots of steroids. Can’t you guys ever just look at the obvious? Rice – 298/352/502, 373 2B, 79 3B, 382 HR, 1452 RBI, 1250 runs scored, 1 MVP, Black Ink of 33, Gray Ink of 176, HOF Monitor of 144, HOF Standards of 43. Belle – 295/369/564, 389 2b, 21 3B, 381 HR, 1239 RBI, 974 runs scored, missed out on the MVP in ’95 because two writers left him off the ballot completely, Black Ink of28, Gray Ink of 137, Hof Monitor of 133, HoF standards of 36. Belle also played 4 fewer seasons than Rice; add those seasons in and many of his numbers improve, although his averages probably drop a bit. Essentially, Belle had Rice’s career just without any downward slope. Of course, the point here is that Belle didn’t receive any support whatsoever for the Hall, while Rice is in. And you certainly can’t argue that Rice was any more useful defensively than Belle. Again different eras, which is evident by the black and gray inks. Also I’ve never stated that I thought Rice was a HoFer. I don’t really care about the HoF. You can’t continually cite the “different eras” argument while conveniently ignoring the home/road splits of Rice. The man’s swing was tailor-made for Fenway park. And if you really “don’t care” about the HoF, then why defend Rice’s enshrinement so vociferously? FWIW BP has Rice at 127 FRAR and -35 FRAA. Most of that badness came from ’82 on, though, he was rated pretty solidly up to that point.